San Francisco’s regional rapid transit agency, BART, just voted not to build a long-planned extension to the eastern suburb of Livermore. To create the consensus to start the BART system, over 50 years ago, unfunded promises were made of future extensions into outer suburbs. The need to fulfill these promises is one of the top arguments for these extensions. But are these promises wise, or for that matter, should they be believed? … allows the transit line to go a place where there will be destinations in walking distance, and where it’s safe and easy to walk. … plans major intensification around the transit line, so that there will be lots of demand there. … allows the line to be built in a way that’s reasonably cost-effective for the transit agency. This problem arises with all kinds of transit, from rapid transit lines to local bus services. Leaders from Town X talk about transit as though it’s their entitlement as taxpayers, rather than something that they have to help succeed. Logically, this leads to creating more transit lines where the necessary conditions for success are absent. That leads, in turn, to accusations that the transit system is failing, when in fact it’s running intentionally low ridership services for non-ridership reasons. A similar problem arises when the transit agency allows itself to be the sole advocate for a transit expansion to Town X. This gives Town X the same message: The transit agency will do all the work; we don’t really have to help. That’s why I am always advising that advocacy for expansion should not come from the transit agency. So be careful what you promise, and be careful how seriously you take unfunded promises, especially ones made long ago. 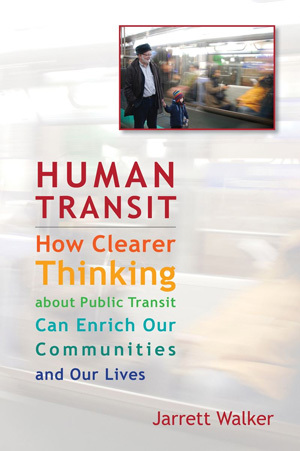 In ridership terms, transit succeeds only in partnership with local government. For that partnership to work, it must be clear that if the local government doesn’t do what’s really needed, the transit may not happen. 21 Responses to Is Anyone Owed a Transit Line? 1. Don’t make promises you can’t (or are not willing to) fulfill. For government, that generally means don’t promise anything that’s not approved and funded in the near term. 2. If a promise is made part of a regional plan, it should be made conditional on the community decisions and planning necessary to make it successful. 3. Once a promise is made, even a bad one, it should be kept unless it is immoral to keep it. Integrity matters. Promises need to mean something. Otherwise, people have no reason to trust anything said group says in the future. I can’t think of any other rail system that needs to hear this *cough*SoundTransit*cough*. Add to “it doesn’t matter:” If town X first encourages widening of the freeway to make the median too narrow for tracks without acquiring additional freeway ROW. The flip side of that is, don’t ask for taxes from areas you are never, ever going to serve relative to the amount of money you’re getting from them. The MTA in New York is particularly bad about this; despite the fact that it has now been 50 years since residents in Queens, Brooklyn, Staten Island, and the Bronx have paid taxes on the promises of new subway services, the subway network in these areas is now *smaller* than it was in 1968, despite record ridership levels. They’re chasing giveaways to developers as outer-borough commuters deal with 1.5 hour commutes in each direction, and in the process they have lost a lot of goodwill. That’s fine. I’m asked for taxes to fund roads in the suburbs and rural areas, even though I already live in a built-out city that doesn’t need any more new roads. Can I stop paying the portion of my taxes that goes to new road construction then, and only pay the portion that goes towards maintenance of my local roads? The major difference is that whereas there isn’t really a dedicated tax for roads, transit agencies go cap in hand promising a bill of goods. If you don’t want people to be upset about projects disappearing into thin air, don’t promise them in the first place, and certainly don’t stake approval of new taxes on projects that are never going to happen. There is a major difference between funding roads and funding transit, and the “justice” involved. Once the road is built, that is the end of it for the burden of funding (at least until the finance is paid off). And a high proportion of the cost is due to the need to engineer it for heavy vehicles; if there was such a thing as a car-only road it would be extremely cheap to build. The same, even more so, applies to road maintenance costs. Certainly the rural sector and the rural trucking sector should pay for their own costs there. The taxes contributed by car drivers (including their pay-in to “subsidies” from general taxation, if they exist) are certainly more than enough to pay for the actually very low costs of having built the road, over the centuries that road will be used. Almost all taxpayers are also beneficiaries of automobility. There is a case to be made for those who don’t use a car at all, to receive some kind of compensation for their own tax burden in so far as it is diverted to “subsidies of roads”, but this would be tiny. Subsidies to public transit, on the other hand, are orders of magnitude greater in terms of person-miles of travel enabled. These subsidies are not subsidies merely of the surface that the vehicle travels on; they are subsidies of the capital cost of the vehicle, its running costs and everything else; which in the case of private motor vehicles, the equivalent costs are definitely paid by the driver. Subsidies to public transport continue to mount up in perpetuity; they do not reflect a massive asset with centuries of life, they represent “people moved around in the past” and the same money needs to be spent again to move people around in the future. I believe the point at which the “subsidy cost of roads” and “the subsidy cost of public transport” cross over each other so that for the same expenditure, a road is “paid back” already but the public transport cost is “sunk” and going backwards from then on in comparison to the “paid back” road, is around 20 to 30 years. I do not mean to provoke a discussion about “externalities” which is what the transit advocates always raise at this point: externalities are not “dollars of public money” and do not affect government’s fiscal sustainability. The cost of externalities and the benefits of automobility, both accrue almost 100% to the same people; if there is any remedy needed, once again it is a tiny number of people who do not use cars, who might deserve a tiny compensation from everyone else. But the magnitude of transit subsidies is out of all proportion to this justified rectification. The most efficient solution to externalities, if they need to be adjusted for, is to charge fees for driving, fees that are aimed at each externality – eg a congestion fee, correct parking prices, and correct taxes on petrol. But for most people, this is inequitable in that they already endure the externalities themselves, and would almost certainly choose to continue to drive and to endure the externalities, rather than stop driving. in addition to maintenance, roads need to be completely rebuilt way more frequently than centuries. Roads need to be policed. Roads cause a direct impact on ambulance/fire/emergency services usage. The maintenance of the road system in the US is subsidized at a rate of about 50%. So it is reasonable for transit systems to be subsidized at a similar rate. Admittedly, US transit systems tend to be subsidized at a higher rate than this due to low US transit ridership. It’s not unfunded. $ 533 million is set aside for this project. Last year, the Tri-Valley San Joaquin Regional Rail Authority was set up by the state legislature to build and maintain a rail connection from Tracy, and eventually Stockton, to the end of the BART line, wherever that might be. That legislation also established that if Bart did not go forward with the extension the $ 533 million would be transferred to the new Authority. The BART Board vote in May not to pick an alternative was 4-5. The new Authority may well be able to pursue this project faster than BART, and going all the way to Tracy and beyond is a superior plan, I’d say. New Authority established summer 2017. BART board decides marginally not to pick a project in spring 2018, thereby transferring established funding to them. It all looks like kabuki theater to me with an extended period to cover lots of asses, but the San Joaquin valley will be better off. $533 million is a tiny fraction of the cost it would take to build BART to Livermore. Maybe 10% of the cost. E-BART cost $ 517 million in 2017$, for a little over ten miles, in a highway median. The recent plans for a Livermore extension are in a similar environment, and BART estimated its cost at close to $2 billion for a full BART build. Which I think you will admit is nowhere near $5.3 billion, but still a lot more than is justified by the transit value. A DMU system, like E-BART, would be vastly cheaper, close to the allocated funding, and even with the inconvenience of a cross platform transfer, would clearly extend BART’s utility. Win-win? Public works projects (and most egregiously the DOD) generally operate on “promise her anything but give her the zzxmart knockoff at Arpege prices”. BART was particularly ugly in this regard both because the agit-prop was way over the top and they were victimized by the same gross price inflation that hammered the entire US in the period. So, those who chose to buy housing far beyond the original terminals think they were promised service to the edge of their cul-de-sac tracts, but not close enough to allow undesirables from urban areas easy access. The far better option is to have the ACE/San Joaquin JPA figure out how to connect to BART for direct transfers. I wish to thank the BART directors who voted down the freeway station. The flip side is that if the transit agency doesn’t advocate for projects, it will build whatever local power brokers want, which is rarely good transit. For example, who exactly would advocate for better integration of suburban and urban transit? It’s not the people in the suburbs, who are used to either driving or taking the train to the CBD at rush hour. Nor is it urban reverse-commuters, because the ones using the Long Island buses are so poor that nobody needs to listen to them; low-income community leaders with political power exist, but they’re based in local areas, so they call for transit investments in a specific low-income area, not for better transit connecting many city neighborhoods with the suburbs. Another example of bad transit coming from local advocacy: Los Angeles. The people in the Foothills want their light rail extension, so they’re getting it, at outrageous cost per rider. The same is true in a number of wedges of the metro area, while circumferential extensions, like the Orange Line to Pasadena, are neglected because they’re not entirely contained in one fief. A third example: Vancouver. The West Side has to be dragged into accepting the Broadway subway, which isn’t even going all the way to UBC, despite low projected costs per rider (even without redevelopment). In contrast, lower-performance extensions like Evergreen got prioritized because local politicians liked them. There is an inherent problem anyway with “planning for redevelopment” along the transit line. Planners can’t force the site owners to actually do the development (in Europe things are different, which is why this kind of planning works as it should). “Development potential” capitalises into the price of a site; allowed density capitalises into the price; public investments in local amenity capitalises into the price; public investments into transport also capitalise into the price. This means that any actual developer who needs to buy sites to stay in business, must pay a higher price up front, to the site seller; and carry higher costs and risks through a property cycle. Furthermore, because developers have to compete with each other for sites, it is inevitable that many successful bidders will go broke, while unsuccessful bidders will run out of work. Accordingly, developers often end up obtaining sites at random locations where the balance between risk and profit potential was more predictable. The actual site owners in the “efficient” locations, frequently have no stomach for actual development, and all the incentives from their point of view are in the direction of acquiring more sites, “holding”, and making ever-more capital gains with no effort. In contrast, ironically, cities with a median multiple of 3, always accompanied by highly elastic development of ex-fringe greenfields suburbs, also have a flat and disciplined urban land price curve. Site values do NOT inflate immediately in response to every planning signal; developers can take their pick of good-value sites and make honest profits in providing floor space for evolving clustering efficiencies. I have often commented that Manhattan evolved like it did at the same time as New York urban area was sprawling at low density and low land costs, for dozens of miles in several directions: I would argue that if New York had had an anti-sprawl prescriptive planning policy like London, there would have been a lot LESS redevelopment, tall-building floor space and skyscrapers than what actually happened. For the reasons I describe. Note that Houston is the fastest-intensifying US city today, and the margin over cities like San Francisco and Portland (which are low-rankers on this statistic) is considerable. I don’t know enough about the specifically transit-oriented aspects, but I would strongly believe that this is also more successful in the cities with flat and disciplined land costs. Zoning is why San Francisco and Portland are not intensifying quickly. Planners can’t force site owners to do development, but unless development is made expensive/impossible (due to zoning), there is enormous opportunity cost to let a site sit under-developed for a long time. If I could sell my plot to a developer for 4x what I bought it for, there will have to be a very good reason for me to not do so. It would have been upside-down to plop a 15-20 minute-headway, 18-19 hours-a-day, urban heavy-rail-mode station in an exurban location where the existing local transit modal share is less than 2 percent. What is desired there (fortunately or unfortunately) is a commute-hour service surrounded by parking. Hence, the Bart Board voting a relatively firm 7-2 against a full Bart mode extension, priced at $1.5B. So while the circumstances are unfortunate, the latest institutional events and decisions as they pertain to this particular case are likely the best combination that could have happened – almost exactly the amount that Livermore has paid into the system ($0.5B) since the creation of the Bart District is now being set aside for the new rail authority mentioned above. It can now proceed with a scope and mode that best fits the budget and travel needs of the exurban community in the corridor. Home › General › Is Anyone Owed a Transit Line?